Written and directed by Academy Award (R) nominee Damien Chazelle, LA LA LAND tells the story of Mia [Emma Stone], an aspiring actress, and Sebastian [Ryan Gosling], a dedicated jazz musician, who are struggling to make ends meet in a city known for crushing hopes and breaking hearts. Set in modern day Los Angeles, this original musical about everyday life explores the joy and pain of pursuing your dreams. Portions of this review also appear in our coverage of the La La Land Blu-ray. Specifically, this Ultra HD Blu-ray review includes unique Vital Disc Stats, Video, and Final Thoughts sections. Ever wish there was a movie that didn’t involve zombies, drug cartels, robots, or superheroes facing off in a post-apocalyptic end-of-world scenario? More often than not, those types of films are taking up all of the auditoriums at your local movie theater. Luckily, every once in a while we get something different, kind, and magical -- luckily, we are so very fortunate to get one of the absolute BEST films in a long time with La La Land. Director/Writer Damien Chazelle (Whiplash & 10 Cloverfield Lane) has made an ode to the golden age of Hollywood musicals, but set in present day Los Angeles with stars Emma Stone and Ryan Gosling. Chazelle really hit home with Whiplash, but La La Land is a more light-hearted take on music and love as a musician (Gosling) and actress (Stone) cross paths in Los Angeles, fall in love, and sees if their relationship stands the test of time and fame as both struggle to make it in their respective fields. This film really highlights Chazelle's talent, as each dance and music number is perfectly scored, choreographed with excellent attention to detail. He pays homage to the old days of cinema without hitting you over the head too often and makes you fall in love with these amazing, yet flawed characters. Gosling and Stone deliver outstanding performances and yes, actually sang and danced on their own, in addition to playing their own instruments. The result was simply magical with an excellent jazz score that I can’t stop listening to. La La Land is such a beautiful film that you will be immediately entranced in its brilliance from the first scene, which is a “one-take” musical number on a 100-foot bridge in Los Angeles with over 100 dancers. The colors and choreography are just incredible and pave the way for the rest of the film. La La Land is a perfect blend of comedy, drama, music, and one breathtaking visual experience after another. This film will be watched over and over again for many years to come. 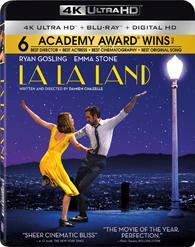 La La Land comes with a dual-layered UHD66 Disc and a Blu-ray Disc of the film. The Blu-rays are Region A Locked. There is an insert for a Digital HD copy as well. The discs are housed in a hard, black plastic case with a cardboard sleeve too. A few trailers play before the menu startup. The UHD release of La La Land is presented in 4K Ultra HD with an HEVC H.265 encode in 2160p and a 2.55:1 aspect ratio. 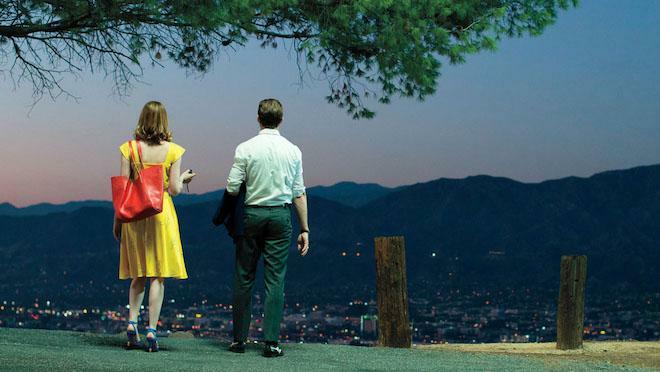 La La Land was filmed in Super 35mm and finished as a 2K Digital Intermediate before this release, which was up-converted to 4K UHD with an impressive HDR10 / WCG grading. The picture is just radiant from start to finish in this colorful musical film. Detail and colors are definitely upgraded from the standard Blu-ray release. The opening of the film is shot on a highway bridge in sunny Los Angeles with tons of colorful dresses and wardrobe pieces that just brighten this image up. The woman in the yellow dress with the white dots is a perfect example of just how the HDR looks here. At first, she's sitting in her car with the yellow dress looking a little flat with muted yellows due to the shadows and darkness inside the car. However, when she exits the car into the bright sunny skies, the yellow dress simply pops as it looks as it's a brand new brighter yellow. The same goes for all the reds, blues, and greens here. These primaries look incredible. When Emma Stone and her roommates are getting ready to go out on the town, the red and blue walls, mixed in with the pink bathroom are deep, rich, and just ooze with different shades of color when lighting hits them. It's an incredible viewing experience. The more earthy tones show up in Gosling's apartment or in the restaurant lounge where he plays the piano with great browns, yellows, and assorted Christmas lights around. Black levels are deep and inky in each scene where the spotlight might shine on one person and everything else fades to varying degrees of black. Nothing looks crushed here. Skin tones also look fantastic and natural as well. Detail has an uptick as well here. Individual strands of hair can be seen easily on the actor's faces, particularly the many different strands of red and orange on Stone's head. Gosling's facial hair also stands out as well. Stitching in the costumes can be seen as well as makeup blemishes on all the actor's faces. Wide shots show every palm tree leaf and vine perfectly without every going soft. Nothing looks flat here as the filmic aspect is kept up, which is always nice. There are some elements that might look a little soft, but that's a style choice to give a somewhat fantasy element to the image. There are no major signs of any compression issues or video noise here, leaving this video presentation with excellent marks. This UHD release of La La Land has an English: Dolby Atmos track that sounds phenomenal. You'll feel like you're in the middle of a rocking concert at some points or in between a personal conversation with the two lead actors. Right of the bat, the surrounds kick into high gear with tons of cars honking from all over the place and with varying degrees of volume, depending on how far off camera they are. The music kicks in and fully engulfs the soundstage with excellent highs and lows throughout. You'll be able to hear each instrument perfectly with a realistic heft as if you were there live listening to it. The concert at the big clubs have all the proper dynamics and echoes that it should, while the lounge locations have background chatter and cheer from the surrounds. It's all well balanced and literally music to your ears. Softer dialogue is clear and easy to follow along with and free of any pops, cracks, and hiss. The score of the film always adds to each emotion in every scene with a fantastic jazz feel without drowning out any other sound aspect. The bass is smooth and never crosses into rocky territory, giving a great heft to the louder music scenes throughout the film. Ambient noises and sound effects are always robust and full and create an excellent soundscape that immerses you into the bustling life of artists in Los Angeles. This audio presentation is such a delight to listen to and fully captures the essence and music of the movie in each moment. Audio Commentary - Director Damien Chazelle and composer Justin Hurwitz deliver an informative commentary track where they discuss what it was like to make the film. They discuss casting, the choreography, shooting on location, their influences, the music, and a lot of technical aspects. They also talk about the themes, tone and some anecdotes from set. If you loved the film, you'll like the commentary. Another Day of Sun: They Closed Down a Freeway (HD, 11 Mins.) - This is a look at the behind the scenes of the opening scene that was shot on the high-rise bridge in Los Angeles with interviews with the crew and on-set footage. They discuss the choreography and how they shot it on location. La La Land's Great Party (HD, 5 Mins.) - This featurette takes a look how they filmed the lavish party scene towards the beginning of the film with Emma and her roommates getting ready and heading to the party. The cast and crew discuss how it was to film the fun party and all the choreography that went into shooting it. Ryan Gosling: Piano Student (HD, 5 Mins.) - This looks at how Gosling trained for the piano with interviews with Gosling, his teacher, and John Legend. 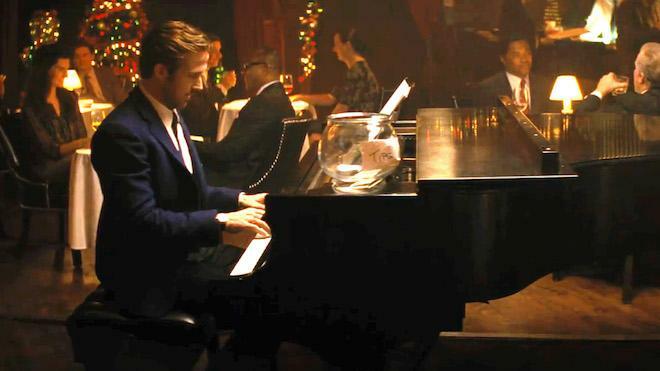 Yes, it is Gosling actually playing piano, as he trained for months for the film. Before Whiplash: Damien Chazelle's Passion Project (HD, 10 Mins.) - Cast and crew discuss how Chazelle wrote and conjured up the idea for La La Land before Whiplash was made. Everyone talks about how much this was the project he wanted to do and what themes he wanted to convey through it. La La Land's Love Letter to Los Angeles (HD, 7 Mins.) - This extra examines the locations used in the film and how much Damien wanted to show the beauty of Los Angeles and how dreams can come true there. The Music of La La Land (HD, 14 Mins.) - The cast and crew discuss the music of the film with on-set footage of the orchestra playing the music and how the jazz element came into play. All of the music from the film is discussed here. John Legend's Acting Debut (HD, 5 Mins.) - This covers how John Legend got the part in the movie and his contributions to the music and him acting for the first time. The Look of Love: Designing La La Land (HD, 9 Mins.) - The cast and crew discuss how the filmmakers used music, color, and sets to give this unique look to the film, showing some behind the scenes footage and some of the set designs. Ryan and Emma: Third Time's The Charm (HD, 6 Mins.) - The cast and crew talk about how much chemistry Ryan and Emma have, due to their work on previous films together. Epilogue: The Romance of the Dream (HD, 8 Mins.) - Again, the cast and crew talk about the ending of the film and how much everyone just loved it, as well as how it was executed on every level. Damien and Justin Sing: The Demos (HD, 5 Mins.) - The two play and sing the demos of two of the songs from the movie here with behind the scenes footage playing in the background in black and white. It's funny because these two cannot sing whatsoever. Trailers (HD, 7 Mins.) - Trailers for the film. Posters (HD) - The different posters for the film are shown here. Song Selection (HD) - You can click on any of the musical numbers of the film and watch it. La La Land is an excellent film that pays tribute to old-school Hollywood in a modern setting, as well as jazz music and musicals of the golden era of movie-making. The song and dance numbers are excellent and have soul with Gosling and Stone perfectly performing them in each scene. It's nice once in a while to have a light-hearted film with music and soul, rather than zombie wars and killer robots. The video and audio presentations here are simply stunning. The HDR is out of this world and the Dolby Atmos track is just lovely on every level. The extras are all worth watching, leaving this release Highly Recommended!